Wheels pitches 10 of the biggest sellers in the medium-to-large car segment to see which is the best of the current crop. 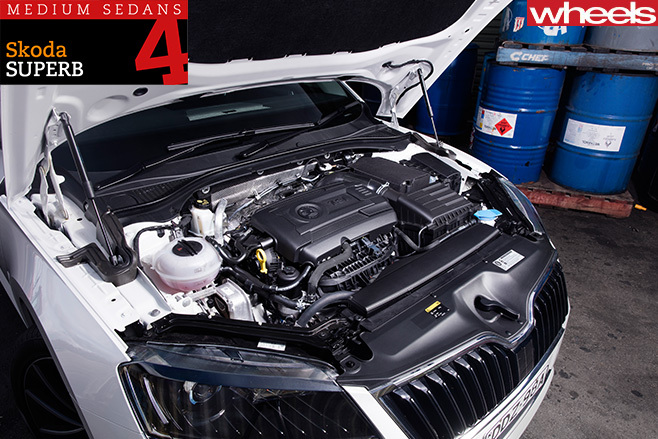 Here’s number 4, the Skoda Superb. 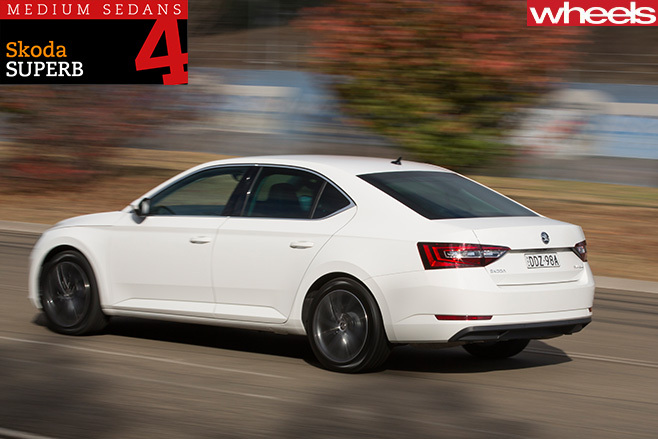 THE Skoda Superb might just be the ultimate hipster machine; the not-quite-cool car you don’t even know about yet. And this, from craft beer to bands, is the quality that makes it perfect for the modern man who wants to stay true to his trend-setting roots. Ironically, like Holden’s Commodore, it’s also slightly out of place in a Megatest of mid-size cars because, while the platform and pricetag fit the bill, the Superb is large. If you value space to stretch in the back seat, only the Kia Optima and Hyundai Sonata come close, but even they can’t match the Superb’s Statesman-like rear accommodation. The rear seat cushion and backrest offer long-haul comfort with excellent lateral support, plus generous headroom. 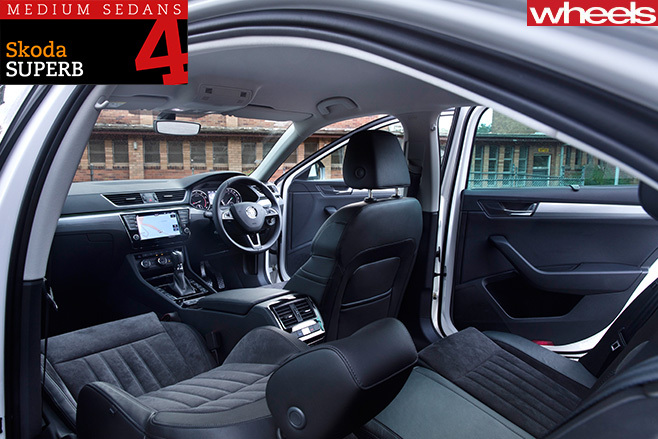 And back-benchers want for nought because they get their own air-con vents with temperature control, a 12-volt outlet, a big ashtray/bin, carpeted door pockets, a centre armrest with twin cupholders, twin map pockets, mesh side-window blinds, even angled footrest mats. The high-mounted front seats, however, feel flat and rather stingy, in total contrast to the excellent buckets in VW’s Passat. But the Skoda’s driver is often too busy revelling in this car’s generous performance to care. Yes, Volkswagen Golf GTI power goes alright in a Superb; the effervescent 162kW 2.0-litre turbo four copes effortlessly with the Skoda’s additional weight (about 150kg more than the Golf). With a 0-100km/h time of 6.6sec, not only is the Skoda deep in hot-hatch territory, it’s quicker than everything else here. The Holden Commodore matches it on power-to-weight, but the Superb is a tenth quicker from 80-120km/h and has it all over the Holden in terms of refinement, low-speed effortlessness and rorty energy. It’s also 30 percent thriftier than the Holden and a virtual match for the miserly Passat, which certainly earns it a gold in the engine compartment. Given the smooth swell of low-down torque, the six-speed DSG doesn’t have to rely too heavily on its smarts and, despite a lack of shift paddles, and the fact the manual gear-lever plane is contrary to our preferred forward-for-downshift orientation, it’s an able ally for the engine. On smooth urban roads the Superb is typical MQB Volkswagen fare, scaled up. Benign initial steering responses segue into a pointier sense of connection the further the wheel is twirled into its lock, while soft suspension delivers a town-car approximation of a Golf, with most of the balance but little of the cohesion or involvement. Where the softness really undermines the Superb’s poise and comfort is on country roads. Underdone – yet also underdamped – spring rates result in a catalogue of problems, from axle tramp during hard take-offs (and it was still quickest on the strip!) to mild float on undulating roads and wallowing, pogo-like handling through really bumpy corners. The Superb treats occupants to more shush than the Mazda, but instead of emerging as the expected better-riding, more pragmatic Volkswagen twin, it falls well short of the Passat’s cohesion. That suggests that this, the automotive world’s wearer of thick-rimmed glasses, has overshot its raison d’être, like many a misguided hipster. But like a semi-established indie band’s Difficult Third Album, there’s still time for it to become The Next Big Thing in family sedans. Making a Superb, well, more so might involve a ticking of the Tech Pack option, which brings adaptive dampers and an improvement to wheel and body control (as well as premium audio and extra safety). Alternatively, you could shop up-spec, skipping the turbo-diesel mid-ranger in favour of the 206TSI 4x4 wagon ($52,690), which gives you Golf R outputs in a massively practical all-wheel-drive package. Given the standard Superb’s pointy baseline pricetag, neither will induce financial ruin, and the latter path might just deliver a budget Audi S4 Avant.